Silicone Wristbands and Rubber Bracelets - Customize your own and get Free Shipping! Order stock silicone bands or create your own custom made bracelet! Originally made famous by the LiveStrong foundation, many people don't realize Silicone wristbands often help serve a greater philanthropic purpose. During the LiveStrong bracelet fad, the foundation was able to raise roughly $470 million from the sale of their $1 silicone wrist bands. It's unrealistic to think that every custom rubber bracelet is going to become popular, but there are many foundations, causes, charities, and events that fundraise successfully with Silicone bracelets. Because of their low cost, custom bracelets offer a low risk option for fundraising efforts. We work with a lot of schools that run programs to create unity with their students. The idea is that if everyone is wearing the same rubber wristband promoting a program, then people will keep the program top of mind. These programs are more successful as a result of the increased participation. We've had schools prmote anti-bullying with customized wristbands, to Read Across America wristbands and every type of wristband in-between. One thing a lot of parents do is create custom allergy alert wristbands their children can wear. With the prevalence of allergies such as peanut allergies, it can mean life or death if someone consumes or interacts with a substance they are allergic to. While not a foolproof solution, custom Silicone bracelets can act as a good reminder for both adults and children to help avoid potentially dangerous situations. There are thousands of different promotional items out there. 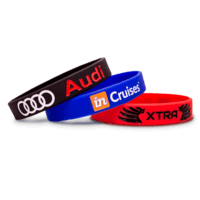 To truly stand out from the normal promotional items that most companies hand out, consider custom Silicone bands. 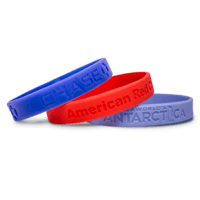 Silicone wristbands are a great and relatively inexpensive product that can be used as handouts for promotional opportunities. Or they can be used to build camraderie within the office place if employees want to show their support of the workplace. 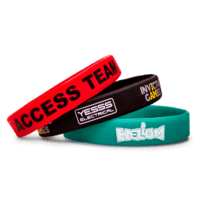 There are a handful of companies that sell custom rubber wristbands, but none of them offer the customization flexibility that we do with no additional cost. Other Silicone band providers will charge extra for logos and extra text on your band. They may even charge you extra for shipping and tax your custom Silicone wristbands unnecessarily! We don't believe in that. You can personalize the whole front and back of your rubber wristband with as much text and as many images as you can fit without any increase in price! You can make your own silicone bracelet right on our site! Our Silicon Wristbands are offered in three different custom styles including Debossed (recessed), Embossed (raised) and Color Imprinted (color imprint on the surface). Color Imprinted bands can duplicate fine details in fonts and logos. Because the imprinted ink is on the surface of the Silicone band, over a few weeks or months, depending on wear, the imprint will scrape off. If longevity is of importance, select a Debossed color filled style. Not only do we offer a variety of custom options, we also carry a number of stock Silicone bracelets that will ship the same day you place your order. Silicone wristbands are perfect for raising awareness, marketing and advertising, and fundraising. Our custom made bracelets are produced with exacting standards for quality, are 100% Silicone and contain NO lead.